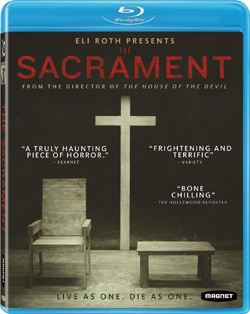 (Release Date: August 19, 2014)  A thinly veiled account of the November 1978 mass suicide perpetrated by religious cult leader Jim Jones, "The Sacrament" is technically fiction, but also harrowingly not. Writer-director Ti West (2011's "The Innkeepers") adopts a pseudo-documentary form to drop his audience into the thick of an already suspicious situation that unravels by horrific design. For the first time within his feature-length work, West's storytelling aesthetic does not hold up to close scrutiny, but the story itself most definitely does. This is a horror picture, all right, but one of real terrors and human monsters, depicted with a quaking atmosphere of distorted tranquility overcome by imminent dread. When freelance photographer Patrick Carter (Kentucker Audley) receives a cryptic letter from sister Caroline (Amy Seimetz) with vague directions to Eden Parish, the secluded cooperative where she has moved since abruptly leaving a Mississippi sober-living facility, he decides to take her up on the offer and go see her. Accompanied by VICE correspondent Sam Turner (AJ Bowen) and cameraman Jake Williams (Joe Swanberg), the two of them looking to shoot a piece on their curious expedition outside the country, Patrick is met at the airport and helicoptered to their desolate location. Immediately, warning signals go off as they are transported through the woods to the pastoral Eden Parish commune, the entrance guarded by hard-faced men with machine guns. Once in the clearing, Caroline meets them, cheerful but taken aback that her brother isn't alone. As they go about interviewing some of the other residents, the hippie air of peace and love is offset by their very isolation to the outside world as the God-like voice of "Father" (Gene Jones) speaks to his followers over a looming loud-speaker system. As with all of Ti West's films, he takes a methodical approach in "The Sacrament," his narrative made all the more intoxicating in its deliberateness and observation. In order to truly involve the viewer, he or she must first become acquainted with the setting, the characters, and the circumstances that have led these onscreen figures to their current, frequently terrifying, position. In concept, Eden Parish might not seem like such a bad place, the people who have decided to move here looking for acceptance and understanding away from a "cancerous" society full of poverty, violence, greed and racism. They build their own shelter, they grow their own food, and they even set up a makeshift hospital and daycare center on the property. What they do not see that Patrick, Sam and Jake very much do is how much they have been brainwashed by their leader, a man whom they treat like a rock-star messiah whose every word is to be trusted and obeyed, no questions asked. At a nighttime gathering where Father has agreed to sit down for an on-camera interview in front of his congregation, his outward friendliness barely conceals his contempt for these journalistic interlopers whom he is well aware are looking for a critical, sensationalistic story. He knows that Eden Parish will very soon no longer be a secret, and that the flimsy façade he has masterminded and the oppressive control he has over his people is about to come crashing down. This is something he is not willing to let happen. Once seen, Gene Jones' (2007's "No Country for Old Men") performance as Father is not easy to forget, his affable personality sharply contrasting with his commanding presence and sickening deviance. As Caroline, Amy Seimetz (2013's "You're Next") is unexpectedly chilling as a troubled woman who has overcome her addictions by giving herselfand her sanity, and her soulover to Eden Parish. If there is one aspect of "The Sacrament" that intermittently bogs down the film's disquieting spell, it is West's decision to tell the narrative via an edited, you-are-there VICE documentary piece. The idea that someone would escape with this particular footage and then release it with a traditionally scary music score seems mighty exploitative. There is also too much camera coverage from different vantage points in certain scenes, putting into question the authenticity of what is posited to be the genuine article. Fortunately, the script is powerful enough to mostly overcome these issues, the unnerving third act kicking off with a worried mother secretly slipping the guys a note asking for help and rapidly devolving with the appearance of a punchbowl and cyanide. "The Sacrament" is strong stuff, a concise, provocative exhibition of how the words of one individual can pull such an influentially harmful sway over a group of vulnerable people searching for purpose. Because "The Sacrament" is entirely made up of on-the-fly documentary-style footage, Ti West and cinematographer Eric Robbins chose to shoot the film with the Canon C300, a professional-grade HD camera. With the exception of an opening talking-head interview made to look like low-resolution television footage rife with color bleeding and banding, the 1080p picture is quite good, sometimes excellent, in its high-def detailing. The picture's aesthetic tonal scheme preferences woodsy greens, yellows and browns, while facial featureslines, frecklesand clothing textures are rock-solid. Some blacks are blacker than others, but this is an intentional creative decision that adds to the film's grittiness. The effectiveness of the disc's 5.1 DTS-HD Master Audio reveals itself in satisfying ways throughout. In the early segments, it might seem like it keeps predominately to the front channels, but listen closer and its complexities start to shine through. Every time Father takes to his intercom, his haunting God-like voice overwhelms one's home theater in the same way he does the citizens of Eden Parish. As things become more dire and the action rises in the second half, so, too, do a wealth of chilling ambient noises that play across the sound field. This is a terrific audio track. Ti West is one of the most exciting and eclectic auteurs of the horror genre to come around since the start of the new century, and "The Sacrament" is one of his most mature offerings. While it isn't my personal favorite, it is still a strong, potent, unforgettable piece of work that relies upon the terror of reality over supernatural beings going bump in the night. Magnolia Pictures' Blu-ray release features accurate-to-source A/V features and some insightful bonus content, including a particularly fascinating commentary track. "The Sacrament" comes highly recommended.